Expensive and luxury cars are used for both business and pleasure. Car owners can take precautions with insurance and be careful drivers, but mistakes and accidents can happen that cause damage to automobile glass. The quick restoration of auto glass is one of the many reasons that residents choose PG Beverly Hills auto glass repair. The mobile auto glass services that are provided eliminate the waiting and travel time of finding a quality repair facility and risking further damage to a luxury car. Thieves and vandals usually target cars and trucks that have perceived values above the average values of standard automobiles. The risk of auto glass damage is increased and may eventually lead to auto theft. PG Beverly Hills auto glass repair technicians are dispatched quickly when damage happens to review the damage and put the plan for repair or replacement into action. This trusted source of mobile auto glass repair helps members of the community avoid the downtime associated with window damage. Parking on the street always increases body and glass damage to your automobile. Leaving your car or truck unattended for any moment of time exposes the automobile to several scenarios that can cause damage. Not every driver that knowingly collides with a vehicle will contact the owner or report the damage. Glass damage is usually discovered by the owner of the vehicle when preparing to depart from work or from errands. 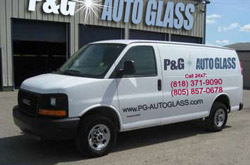 PG Beverly Hills auto glass replacement specialists work quickly to replace broken windows on your car or truck. Driving in extreme weather conditions is a leading cause of glass damage for motor vehicles. The unpredictable winds associated with changing weather are known to blow dust and debris against the windows of your car. It does not take much force from debris to crack or break your automobile glass in extreme weather. PG Beverly Hills auto glass repair technicians provide high quality OE replacement glass and guarantee the installation against leaks or defects after replacing your automobile glass. This service is why residents choose PG Auto Glass. If you are looking for auto glass replacement in Beverly Hills, our mobile service vans can arrive at your place in the shortest amount of time possible to do the job. Our technicians can also provide you with auto glass repair in Beverly Hills or any other city in Los Angeles to get to back on the road as soon as possible. Are you searching for an auto glass repair and replacement service in Beverly Hills, CA in zip codes 90209, 90210, 90211, 90212 or 90213? Contact PG Auto Glass and our technicians will be able to help you immediately.